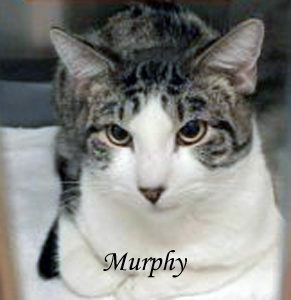 Handsome Murphy is looking a little sad and bewildered. He had a home once with other cat friends, then — one day–they were all left at a municipal shelter by a person who could no longer care for them. Imagine how frightened he was at this change in his life! Happily, Last Hope came to his rescue and made sure that all his medical needs were taken care of. Now he’s waiting longingly for the loving forever home that he so much deserves. 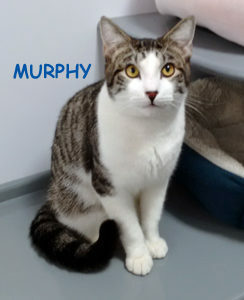 Murphy is estimated to have been born in August, 2016. This sweet guy loves to be petted and held gently. And he plays gently, too! He’s still getting over the big changes in his life, so he can be a bit shy right now. Stop by for a visit with him and see what a wonderful guy he is. Perhaps YOU are the person who will make his dreams of a real forever home come true! This entry was posted in Adopted, Adopted Cats, Adult, Cats, Male, PetSmart - Huntington Station. Bookmark the permalink.